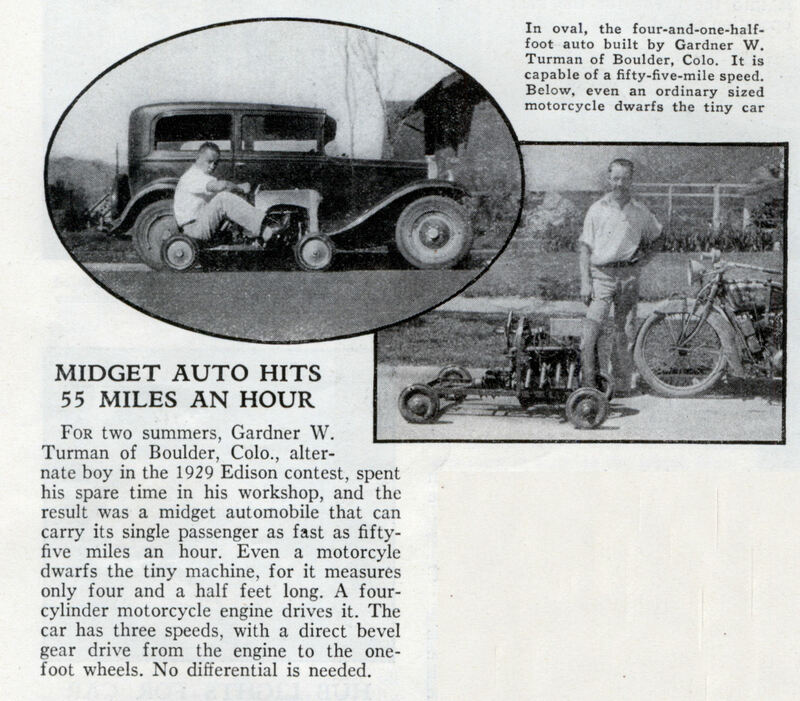 For two summers, Gardner W. Turman of Boulder, Colo., alternate boy in the 1929 Edison contest, spent his spare time in his workshop, and the result was a midget automobile that can carry its single passenger as fast as fifty-five miles an hour. Even a motorcyle dwarfs the tiny machine, for it measures only four and a half feet long. A four-cylinder motorcycle engine drives it. The car has three speeds, with a direct bevel gear drive from the engine to the one-foot wheels. No differential is needed. Last month, along with 48 other selected “bright boys,” one Charles H. Brunissen of West Redding, Conn., went to West Orange, N. J., and answered the long lists of questions whereby Thomas Alva Edison, aided by the U. S. press, sought to find the most eligible young man in the U. S. to become his understudy (TIME, Aug. 12). 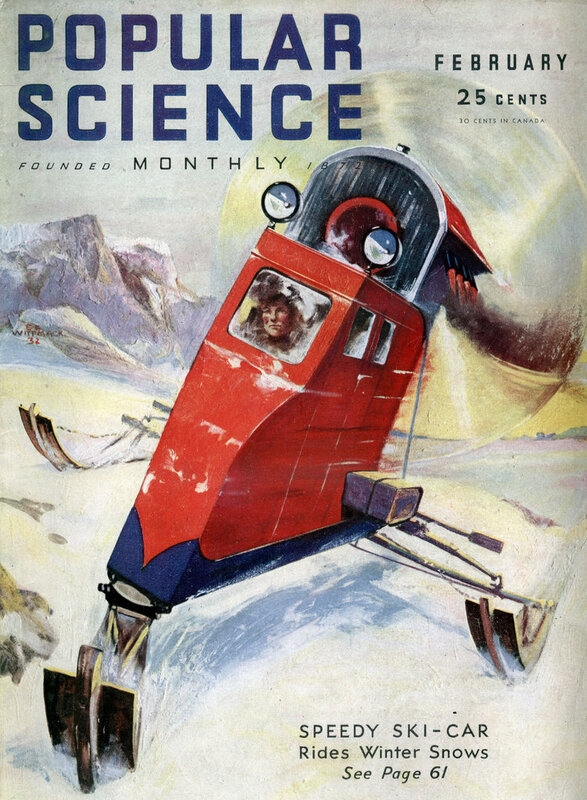 After answering Mr. Edison’s questions, Charles Brunissen said he thought many of them were “senseless, idiotic.” Then he learned that though he had not won the contest, with its prize of a four-year scholarship at Massachusetts Institute of Technology, he and the three boys from Pennsylvania, New Mexico and Indiana, respectively, had done so well that Mr. Edison thought they deserved four-year tuition at any U. S. college. Bright Boy Brunissen chose to enter Yale. Last week came news that he had been offered by a Mrs. R. B. Stevenson of El Paso, Tex., both tuition and board at M. I. T., where he had really wanted to go. Said he: “It would be foolish of me to refuse. . . . I shall notify the Edison Co. to that effect. . . .” Thus it came to pass that the Brightest Boy in the U. S.â€” Wilber Brotherton Huston of Olympia, Wash., winner of the Edison contestâ€”will have as his classmate and scholarly competitor one of the Second Brightest Boys. When they emerge from M. I. T. four years hence (if both are graduated), the marks of Students Huston and Brunissen will certainly be compared, analyzed, editorialized in the public prints. As an afterthought Louis Delafleur of Utica, New York’s “bright boy,” hitherto undistinguished among 44 unrewarded contestants, was given the tuition rejected by Bright Boy Brunissen. Mr Turman also holds a Canadian patent for a gasoline nozzle. I was thinking more of a go-kart actually from looking at it.